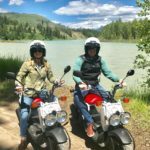 Glacier Moped Rentals – Booking for 2019, Call Now! Glacier Moped Rentals are located at the Crown of the Continent Discovery Center, just one mile from the West entrance of Glacier National Park! Moped rentals offers the traveler a unique and fun experience. Use mopeds as alternative transportation for Glacier National Park sightseeing and self-guided tours. Guests receive a self-guided tour map, and may choose to download a satellite tour map. Furthermore, riders can feel comfortable operating the Honda Ruckus; they are a heartier moped that is easy to use in mountainous landscapes. Mopeds satisfy a number of uses, and can be rented for one hour or several days. Additionally, motorcycle licenses are not required and staff will provide operating instructions. Why Rent Mopeds to See Glacier National Park? Summer is for moped rentals, and it’s the best way to get an instant eye-full of Glacier National Park! 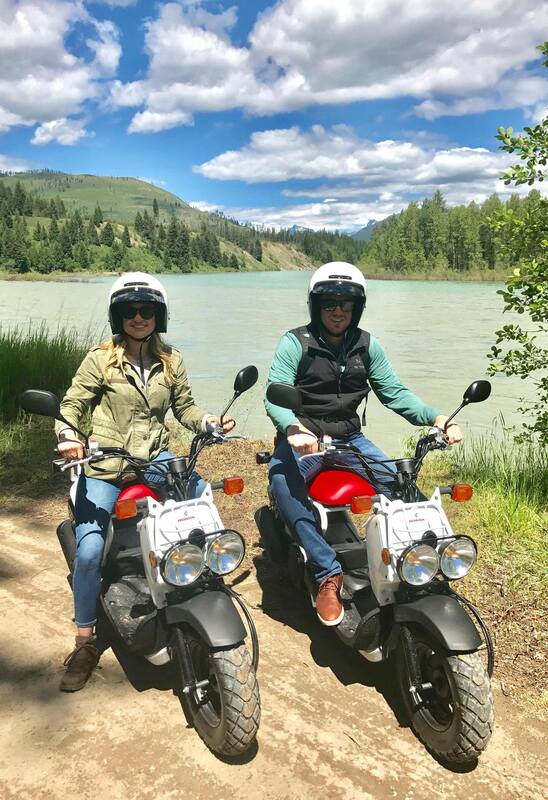 Moped rentals are loved by adventure travelers who seek the freedom of a self-guided tour with unobstructed views of Glacier, while zooming around in the open air. Mopeds are easy to use and do not require a motorcycle license! Park and ride to Glacier National Park to avoid summer traffic congestion during your visit to Glacier National Park. GNP and Eagle Transit partnered to provide a shuttle that services several location pick-ups and returns around Flathead Valley. Park at the Crown of the Continent Discovery Center, 12000 US HWY 2 East, West Glacier, Montana. Summer out-of-park shuttle service offers a daily schedule starting July 1 through September 4, 2017. 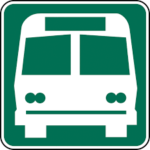 $5 per/ round trip is paid to the shuttle bus driver upon pick-up. Fare does NOT include entrance fee to the park. Rent bikes at Glacier Guides Montana Raft, located across the road from the Crown of the Continent Discovery Center, US HWY 2 in West Glacier. Ride bikes directly from the rental location to Glacier Park via the paved non-motorized bike path. Glacier Guides also offers guided bike tours in Glacier National Park.